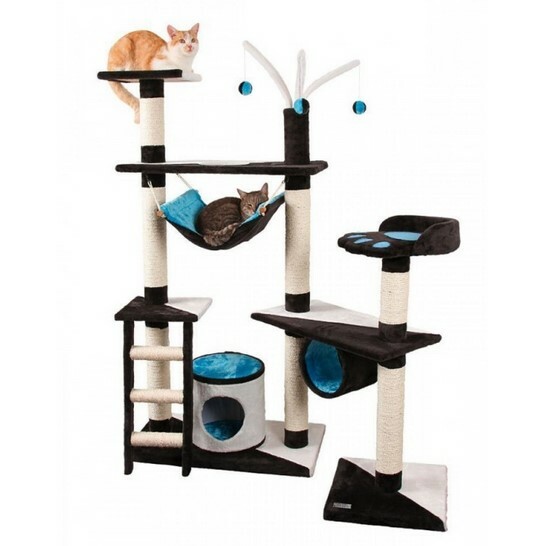 Build Your Own Cat Tree With Materials On Hand - Thinking about how to build a cat tower without breaking the bank? Read on to discover things our human did to make us a great kitty climbing tower without spending a fortune - even though we're worth that fortune! Why a cat climbing tower? Why should you build a cat climbing tower in the first place? From your cat's point of view there is already multiple cat climbing toys in your home; your pants legs, the curtains, the bookshelves, the closet shelves, etc. If we don't have a specific spot of our own, we're going to claim one of yours. You meant us to share your lives, didn't you? Seriously, if you have a cat you need a cat climbing tower. Kitty would much rather have her own spot where she can climb and nap undisturbed than take one of yours. Why build Your own cat tower? Does building a cat tower on your own seems daunting? If you have some basic skills and some plans you can build one. Remember, it just needs to be solid and fun not a work of art - at least the first one. There are a couple of reasons to build your own instead of buying one, one of the biggest reasons for most people is the cost. The cat trees you see in the pet stores are pretty pricey. With some plans, know-how, imagination, and help from your cat, you can build your own. The other reason to build your own cat climbing tree is that it's a fun project! Yup. A kitty tower is an easy beginner project that doesn't take a lot of skill, is small enough to complete without getting frustrated and the finished project will be enjoyed by kitty despite any flaws. You might care about how it looks, but trust me kitty is going to appreciate your efforts and with some good plans to take you step by step through the process the end product will be a success that you'll enjoy having around. Who knows, you might want to build another more elaborate tree or start another project! Materials for your cat climbing tower. The materials are the costliest part of building your cat tower. Take a look around and see what you have on hand. Do you have any carpet scraps left over from finishing the basement? Pieces of plywood that are too big to throw away but too small to do much with? Designing your kitty climber is going to depend a lot on what you have on hand or what you're willing to spend on materials. Carpet scraps attached to plywood with a staple gun and glue make perfect platforms and cheap if you already have them on hand. Play around with the design to see what you'll need to buy and what you can incorporate from what you already have. A plastic bucket with the bottom cut out, lined and covered in carpet makes a great hideaway. A plywood box for the base with holes cut in it for climbing in and out of making a great fun house, more interesting than just a plain post and platform. Have 2 small posts instead of one large? Maybe use them to make a smaller tree or one that doesn't go straight up. You are only limited by your imagination. Basic skills and a plan will go a long way to help you avoid costly mistakes in building the cat tower of your kitty's dreams and keep you within your budget using the materials you already have on hand.